I have been a big fan of cold brewed coffee since I first tried it. 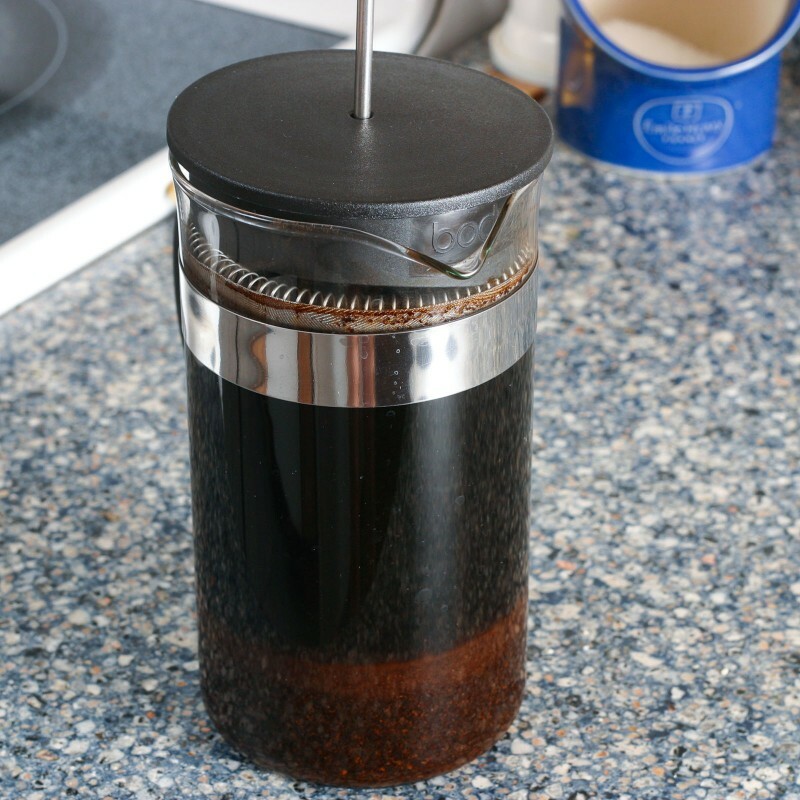 I learned about this method from a Washington Post article on the Toddy, which is a great device for cold brewing coffee. The article described the smooth, but full flavored cup that cold brewing produces and I had to give it a try. I ordered a Toddy and we have been brewing with for about 3 years. The Toddy makes it really easy to produce a large batch of coffee concentrate. Place the filter pad in the bottom, plug the drip hole, throw in a pound of coffee and then add 2 quarts of water. You then wait 2 hours and drain into a carafe. 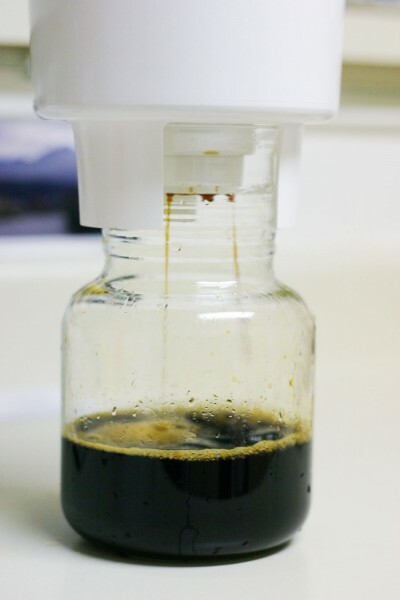 The concentrate can then be mixed with milk or cold water for a great iced coffee or with hot water. It can keep in the fridge for two weeks. I was hooked on this system. Mixing the concentrate with milk produced an extra tasty iced coffee. This may sound weird but the taste comes close to matching the smell of fresh coffee as any method I have tried. The other great part is that you can use normal pre-ground, regular old Foldgers and still get great results. You donâ€™t necessarily get a very complex flavor â€œprofileâ€ with lots of different notes, but you do get a very strong coffee flavor. It taste almost like melted coffee ice creamâ€¦ in a good way! All of this joy came to an end when my Toddy brewing bucket developed a small crack that caused it to leak. Luckily right around the same time someone gave us a French press as a gift. It produced a great cup of coffee, but one that was quite different than the Toddy. As summer rolled around, I yearned for a good cup of iced coffee, and not the watered down kind that comes from pouring hot coffee over ice. Luckily it eventually dawned on me that cold brewing coffee doesnâ€™t required special tools. The real magic is in letting the coffee and water sit together. The Toddyâ€™s real strength was in making it easy to strain a lot of coffee. While pondering this I realized that the French press was also good at straining coffee grounds, and I set off on a path of discovery. Actually all I did was calculate backwards the water/coffee ratio in the Toddy recipe, throw it in the French press and then gave it a try in the morning. To my surprise I was able to easily filter out the coffee grounds and the resulting concentrate produced a great cup of coffee. I originally started measuring the coffee out by weight, but then got lazy and used volume. So far my results have been great! My French press is not big enough to make a full pound of coffee, but I find that even though the concentrate can be stored for 14 days, it does start to taste stale towards the end. The smaller batches taste fresher. Pour the coffee in the press and then add the water. On my unit the water and coffee comes right up to where the plunger would start. Depending on how strong your coffee is you may want a little more or less water. Stir the coffee with a wooden spoon of chopstick. You want to make sure all of the coffee grounds are wet. Wait, about two minutes and stir again. Some of the grounds should now settle to the bottom instead of all floating at the top. Wait 12 hours. I have seen other recipes that say it should be good after 4 hours. I have also other recommendations that after 15 hours or so, you start to extract some of the bitter flavors from the coffee. I usually aim for over night. Press down slowly on the plunger. Pour out the concentrate into an airtight container. You might want to avoid pouring the very last part, it might be a little murky. I use a French Press that holds ~4 cups or 3 mugs. When making hot coffee, I use 3 coffee measures (1/mugful) but when making a concentrate for cold coffee, I double this and use 6 coffee measures. Use room temp water as hot water releases some of the acids and iced coffee shouldn’t have any acidic taste. Stir the mixture a little then let set overnight, then pour the strained liquid into a pitcher (I use a glass one) and put in the frig. Later, when chilled, use a 1:3 ratio of coffee concentrate to half& half, add some ice cubes (~3) and a little flavoring syrup. I’ve use the liquid flavored coffee mate type creamers and these are good but the half&half & flavoring syrup is better. If the girlfriends are coming over, get a can of real cream ready whip and top off the mugs, then sprinkle with cinnamon or cocoa powder. If you like it but want it stronger, add more coffee grounds to the 4 cups of water in the beginning or use less cream. Use a ‘drip’ grind. A coarser grind will give you less flavor per volume of grounds as there is less surface area for the water to interact with. Told to go on a low acid diet so I’m soooo excited about trying this! Using Simpatico, ground course, and now it’s sitting in my French press…. So when I’m ready to add the hot water, what is the concentrate to hot water ratio? I want to make coffee concentrate, of say N.Orleans Coffee, in my French Press. Please tell me how many ounces of coffee and cold water should I add in order to serve each cup of coffee in accordance to manufacturer recomendations. Sorry all for a newbie silly question: what is the difference between this and just brewing double or triple strength coffee in a regular coffee maker? It just seems to be so much hassle and extra expense. Is it really worth it? I’m something of a newbie as well, but I hear one advantage of cold brewing is that it has 70% less acid compared to hot coffee. It’s easier on your digestive tract and doesn’t require you to drink as much water to neutralize the acid content. Spot on Noah! The Coffee is less acidic and has less of a bite. I have found you can get away with using poor quality coffee because the harshness doesn’t seem to get extracted out, so it may not end up being more expensive. I should look into that. I’m trying it for the first time as my Toddy maker broker, but this makes perfect logical sense. My bodum holds 4 cups, although I followed your recipe, except I’m using Godiva coarse ground chocolate coffee, hopefully it’s great! One may *freeze* the coffee extract in ice cube trays in your freezer and this allows one to store them indefinitely (almost) in Zip Lock-type bags. Just an alternative storage method for longer periods of time. I am slightly puzzled! Why does it take only 2 hours to do a batch in a Toddy but using the French press it takes 4 hrs / 12-15 hours? I think they might have accidentally misprinted. I have a toddy maker similar to the one on the top in the photo and it takes 12 hours to sit. I think it takes 12 hours with almost any of the toddy makers. I heated ~2 oz of the cold coffee concentrate in a small coffee cup in the microwave for 30 secs, stirred in a small amount of sugar and presto, cheap espresso! Beats a $500 espresso machine.